In early 2013 the Kent State Truth Tribunal (KSTT) submitted human rights questions to the United Nations for the United States to address. This year the United States continues in the process of being reviewed by the United Nations, Human Rights Committee, readying for its formal review in October 2013. On Thursday May 30, 2013, this first consult statement from KSTT was voiced to the United States. “Good afternoon: I am Laurel Krause for the Kent State Truth Tribunal and my sister Allison Krause was shot dead by U.S. military bullets at Kent State University on May 4, 1970 as she protested the announcement of the Cambodian Invasion in the Vietnam War long ago in America. With regard to Allison’s death, and the three other American students killed on May 4, 1970, there has never been a credible, impartial, independent investigation into the May 4th Kent State Massacre. In 1979 at the end of our courtroom quest for Allison’s justice we received $15,000 and a statement of regret from the United States government. 40 years later in 2010, new audio evidence was discovered in a tape recording, analyzed by internationally-respected forensic evidence expert Stuart Allen. It is now three years later and the U.S. federal government continues to refuse to acknowledge or examine the new evidence yet over these past three years we have demanded that the Kent State Strubbe tape be examined … to no avail. 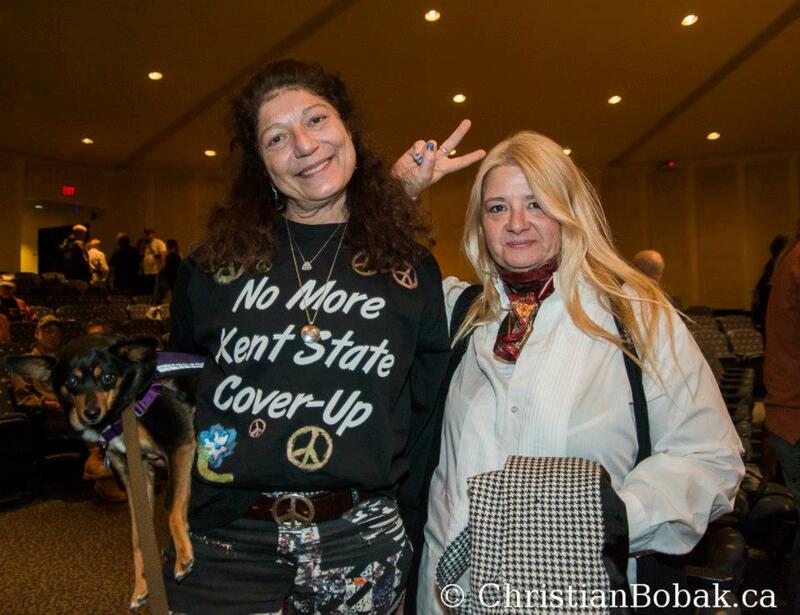 While Kent State human rights issues are not explicitly mentioned in the list of issues, they are covered by a number of general questions raised by the Committee, especially under Right to Life, Obligation to Conduct Independent, Thorough and Credible Investigations into Excessive Use of Force and Firearms by Police/Military, and Right to Effective Remedy. 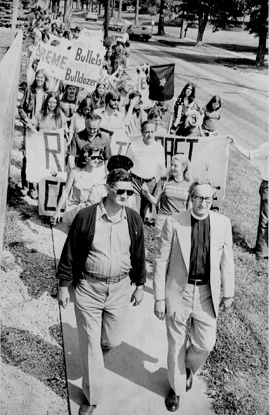 HERE WALKS my dad, Arthur Krause with Reverend John Adams and other protesters on his last trip back to Kent State. His daughter and my sister, Allison Krause, was slain at Kent State University in the student protest against the Vietnam war on May 4, 1970, a day that forever changed our family and civil rights in America … a day that changed America. Approaching the anniversary of Allison’s killing, the energy from that time calls out with new evidence and the truth. Current events and the emergence of new evidence in the Kent State Strubbe tape http://bit.ly/1gcCCWo, demanding we as a democratic, just nation must re-examine what went down in the sixties, ending at Kent State on May 4, 1970 … when the state slaughtered protesters, a crime against man. As I waited at higher ground from 7:00 am on into the afternoon, I realized how this world event had transformed humanity … the way we live together globally. Hours after that massive shake, we were shown on every level that what happens there, happens here as we are all connected on this third planet from the sun. Most importantly, the nuclear event at Fukushima shows us the deeply polluting, over-reach of corporations, echoing George Orwell’s 1984 and Kurt Vonnegut’s Cat’s Cradle. Fiction from the 60’s now becomes commonplace reality in 2011. General Electric, the developer of the nuclear technology used at Fukushima also conceived the overall design, organized the construction and manufacture of Fukushima’s parts. GE literally put together the concept behind and the ‘gears’ of the Fukushima nuclear reactor. Yet following this tsunami in Japan and the nuclear alert created at Fukushima, GE’s first step was to protect their corporate interests and distance the General Electric, GE brands, claiming TEPCO’s majority ownership. Corporate-owned media machines backed them by never referring to General Electric as a player in this nuclear horror, following the same playbook as the BP Deepwater Horizon disaster and the BP brand from last year. GE continues to disassociate itself from Fukushima and in these actions, GE takes no responsibility for the nuclear plant they designed and built years ago, pointing the finger instead at their customer and partner TEPCO, another corporation. We also see how the Corporatists eat their own, shown last week with BP bringing lawsuits against Transocean and the blow-out protector manufacturer. Each of these players, along with BP, are clearly responsible for the world’s worst oil disaster and how it continues to evolve ~ polluting, degrading and jeopardizing the eco-health of a large portion of planet Earth. When will these offending corporations take responsibility and engage in the required significant remedial clean-up (as in making whole again) as well as thorough research or analysis of the eco-damaging event? When will we demand accountability and hold their feet to fire? To date that is nothing beyond a handful of lawsuits, pay-outs, fines and, yes, bonuses and awards in 2010 to Transocean for safety, of all things. Lest we not forget newly-awarded energy contracts just signed by the US government and BP. Or the two TEPCO-directed nuclear plants to be built in Texas with $4B of tax payer-derived funds. All’s going great in eco-disasterville for Corporatists in America. Back to Fukushima, the US nuclear energy lobby and US reactor manufacturers (top players, GE & Westinghouse-now Hitachi) without pause, continue skipping down the same development path, lacking proven safety procedures and offering not one innovative effort to safely begin bioremediating the nuclear disaster as it unfolds in Japan. Just days after Fukushima began it’s radiation spew and without missing a beat, President Obama announced US commitment to continue to fund and develop new nuclear reactors as a key energy technology for our country. As their response to Fukushima, China, Germany and many other countries have placed moratoriums on new development in nuclear energy with Germany going a step further to begin de-commissioning every nuclear reactor there. At my local supermarket a colleague whispered that the GE engineers, the guys that originally conceived of these water boiling nuclear reactors for GE, left the corporation quickly thereafter, quitting to become anti-nuke advocates. They realized the power unleashed in the technology they created, along with humanity’s inability to control or harness nuclear fission in a disaster scenario … like a tsunami. Going back more than 40 years ago and related to nuclear energy, I remember heated arguments around the Krause family dining room table circa 1967-69. Allison, my sister, was 16-18 and I was 12-14. Dad was pro-Vietnam war, voted for President Johnson and worked in management at Westinghouse Electric Corporation. Because of this Dad was de facto pro-nukes. Allison was against the Vietnam war her friends were being drafted into and against the dangers of nuclear weapons as well as nuclear reactor manufacturers. I stood with Allison, Mom with Dad, as the nightly battles ensued. Before Allison and I were born, Dad came home from WWII and he married my mom Doris. They moved to Chicago where he studied at Illinois Institute of Technology. His first job was at Westinghouse and it became his lifelong employer, common back then. His employment at Westinghouse Electric Corporation was a big part of our family life. My folks first settled in Cleveland, Ohio. Then in 1963 we moved to Westinghouse headquarters in Pittsburgh, PA. From there we moved to Wheaton, Maryland with dinner arguments as Allison found her voice, progressing through high school. Going back to 1967, the emerging counter-culture energies of the sixties were in high gear ~ like we have never really seen since. As a pre-teen, I looked up to my older sister by four years and we stood together as a united front against our parents, reflecting the generation gap back then. TV news blasted widespread unrest, chronicling national protests as we watched bloody Vietnam warfare footage with body-bags of returning killed American soldiers. 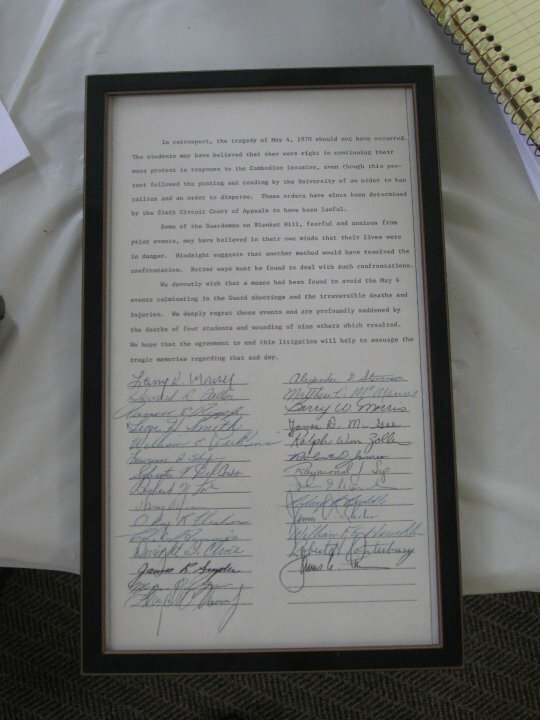 Many of the dead draft-age men had never voted for or against the war as the voting age was 21, changing to 18 in 1971. Back then our folks, especially Dad was a lifelong democrat, supporting President Johnson’s Vietnam war. Allison locked horns with Dad about the war and how he made his living, his jobs at Westinghouse involved streamlining systems, progressing to creating the computerized shipping & tracking systems for shipping Westinghouse nuclear reactor parts worldwide. Allison and most everyone her age back then was pissed off at the US Government. By 1968, Allison was protesting the draft and the war in Vietnam with all her friends … no one wanted to die for the war in Vietnam. Male friends her age were required to participate in a lottery, being drafted into the war. To escape the draft, many peaceful folks enrolled in college or dodged the draft by going to Canada as it became impossible to get Conscientious Objectors status. If you drew a bad lottery number based on birthdate, you were forced to make some very serious decisions. As the Vietnam war progressed and President Nixon was elected in ’68, Nixon grandstanded on his secret plan to end the war as he covertly full-throttled secret bombings in Laos and Cambodia that started early in his first term in 1969. Back to the Krauses, as mentioned there was a riff about how Dad made his living. Dad was a well-respected and forward-thinking manager at Westinghouse Electric. He loved his job and enjoyed fixing systems so our family was transferred to plants that needed his help. As a young kid I remember Dad’s work colleagues greatly respecting his contributions. Years later Dad would receive the coveted Westinghouse ‘Order of Merit’ for his superior and lifelong contributions. In our home back then, my sister and I did not share that pride for our father’s work. We also knew that by-products from nuclear reactors contributed to the manufacture of nuclear weapons, something else we were wishing to eradicate. We felt the conflict around Dad’s activities and the income he provided at the expense of our safety on Earth and our environment. We knew it back then and brought it to his attention. That wound between Dad and Allison never healed. Allison continued to protest against the war and for honoring our environment. She resented being called a bum because she disagreed with someone else’s opinion. She felt that our crossing into Cambodia was wrong. Is this dissent a crime? Is this a reason for killing her? Have we come to such a state in this country that a young girl has to be shot because disagrees with the actions of her government? As Dad learned his eldest child was murdered by the US government as she protested the Vietnam war, something he didn’t agree with, he fought back for Allison’s stolen life and civil rights ~ for the lives and rights of Jeffrey Miller, Sandy Scheurer and William Schroeder on May 4, 1970. Within the year President Nixon’s men strongly encouraged my folks to stop demanding investigations, drop every legal inquiry, offering Arthur Krause bribes for millions of dollars and my father turned them all down. Just the same, our family was put under surveillance by the FBI for years, continuing to this day. The Kent State law suits were heard in court houses all the way to the US Supreme Court and back over the next nine years. In 1979, Dad’s efforts settled at $15,000 with a plaintiff’s civil settlement statement and the ‘statement of regret’ was personally signed by each of the guardsmen that shot at Allison, along with their commanders ~ something Dad insisted on. Dad fought for Allison’s right to protest and her murder at the hands of the United States government until the end of his days. Arthur Krause knew that the murders at Kent State 1970 were personal for us, yet important for all. Recollections on what would have been my sister Allison Krause’s 60th birthday. 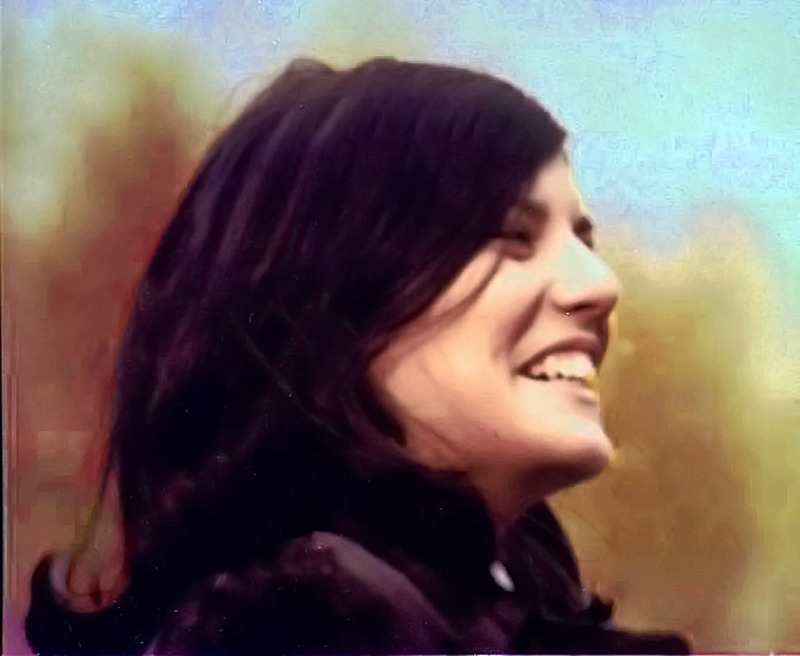 Instead at 19, Allison was murdered by the United States government at Kent State University on May 4, 1970 as she protested the Vietnam war & the military occupation of her campus. Allison had just graduated from JFK High in Maryland the summer of 1969. It was Woodstock Summer http://youtu.be/Vv98-4eOJbU where everywhere in the US, especially in DC, was exploding with political discontent, an escalating war in Vietnam & the feminist movement was finding its voice. Hope for peace was abound, as well as concern for taking care of mother earth. Probably the innocence of youth yet so many young people were coming together in wishing to create a better world. Allison Krause, my sister, was actively taking part. Allison’s decision to go to college at Kent State University in the coming Fall was made quite young. Allison & I were born in Cleveland & raised in our early years in Cleveland Heights. As a family on Sundays, we often took drives out in the country. As far back as I can remember Allison knew she was going to go Kent State University when she went to college. Eating at the Robin Hood restaurant, remembering this warm family memory with Allison loving the pretty campus of Kent State, especially in the spring with the lilacs. So when Allison made her decision to go to college, Kent State University in Ohio was her only choice & application. That Summer of ’69 our folks were gone many weekends ~ traveling, finding & buying our new home in Pittsburgh for a move by Fall as my father was transferred to Westinghouse Electric HQ. It was bittersweet for Allison as she was leaving a closely-knit circle of friends & her Maryland home, yet that Summer I remember weekend parties at our house. In 1969 Allison was 18, I was 14 & I smile ~ the ‘times they were a’changin’ & we were a’groovin’. 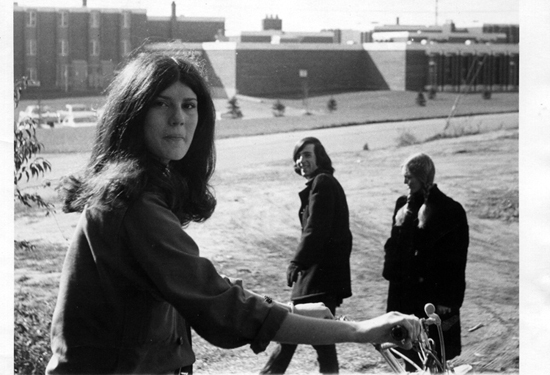 The Fall of 1969, Allison went to college & studied as a freshman at Kent State University. The Krause family had moved to Pittsburgh, PA & I was in junior high back in the ‘burg. This was our second time in Pittsburgh for my dad’s job at Westinghouse. Remembrance of the Fall into Winter of 1969 is mostly a blur. Can recall that Allison had met the love of her life quickly into being at college, that she had a large circle of friends, was thriving & learning. Allison traveled to Washington DC for a huge anti-war protest that Fall ~ http://youtu.be/AoeWqtjCJ_I She was also making plans to transfer to another college. And Springtime meant birthday time ~ April 23, 1970 was Allison’s 19th birthday so I went to visit my big sis away at college, my first weekend adventure on my own, meaning without the folks in charge. Taking the train from Pittsburgh to Kent in just under three hours, Allison met me at the train tracks. What a treasure that we were able to hang together on our own as sisters. We went to see the new movie ‘Woodstock’ together that weekend as my sister showed me her college world & introduced me to her friends. My folks picked me up to go home that Sunday. Looking back now, realizing for the first time how blessed our family was to visit together that weekend. Less than ten days later, on May 4, 1970 Allison Krause, Jeffrey Miller, Sandy Scheurer & William Schroeder were killed by U.S. military gunfire. As Allison died, she was protesting the Vietnam war & the military occupation of her college campus by the U.S. government.